In the Central Padan Plain, it is very easy to combine physical activity to relax, culture and good food. There is nothing better than a nice bycicle ride to get to know these lands: you can discover every meter, every corner, details and views that would otherwise escape. A trip with the times and quiet rhythm through green meadows where the vegetation is mirrored on the crystal clear waters, beautiful villas surrounded by rice fields or fields of grain, ancient churches and oratories, educational farms, farms and farmhouses where you must stop for tasting and buying local quality products. The itinerary, indicated by specific signs, proposes a 45 Km cycle-pedestrian ring route that crosses the six municipalities exploring all the best sites of the area. The itinerary mainly runs on existing rural and urban streets, along rivers and through farm tracks. 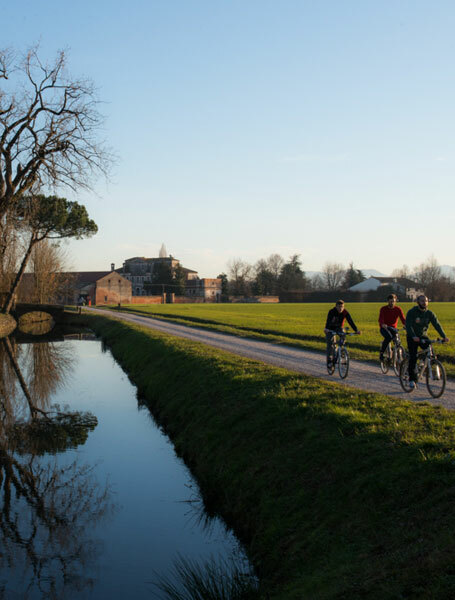 In the municipality of Grisignano di Zocco the route extends to the bicycle path belonging to the Treviso-Ostiglia area. It is a safe and easy route, perfect for families with children.